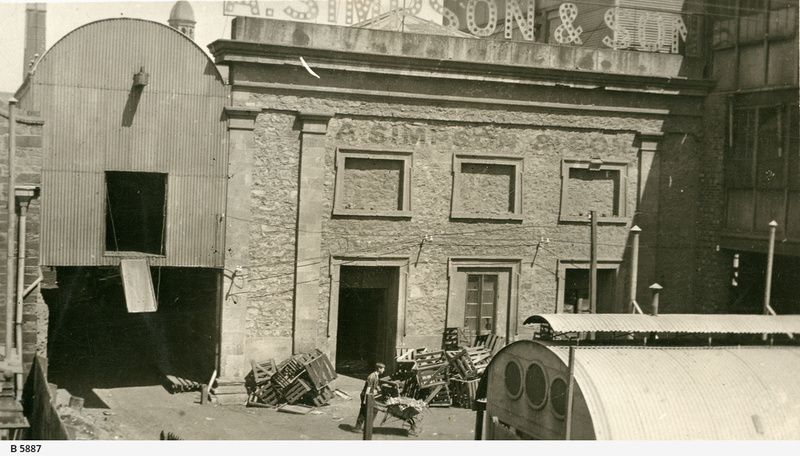 [General description] View of eastern front of the Old Congregational Chapel, taken from a distance, showing a workman with a wheelbarrow and piles of crates stacked against the building. It has clearly been absorbed into the industrial complex of A.Simpson & Son with signs painted on the building and displayed above it. See B 5882. [On back of photograph] 'Acre 205 / Gawler Place / Old Congregational Chapel / eastern front / 1923 / For exact site see B 1206'.